Every year massive amounts of valuable resources are deemed “waste” and consigned to landfill. Take the UK – around 540 million tonnes of products and materials enter the country annually, but only 117 million tonnes are recycled. For the circular economy to thrive, we must be serious about reducing waste. And yet we’re still locked into an “iron cage of consumerism” – shifting to a future in which we’re more efficient with materials will require significant changes in the way we consume things and in the way businesses are organised. We need to focus on making new stuff last longer. In short, we need to do away with the “consumer culture”. To do this, businesses need to think differently about the ways in which products are provided to consumers. The average consumer expects a washing machine to last six years before it needs to be replaced, and Which? magazine cites quality and reliability as strong buying criteria. So why don’t people actually keep their washing machines for that long? It’s because they’re confused by the labelling. Consumers tend to assess the expected lifetime of large household appliances through the manufacturer’s warranty. However most just give between one or two years warranty, making it difficult for the consumer to really assess how long it would last. More leasing would thus significantly cut the use of materials. Appliances could be re-used from one consumer to another while all repairs would be undertaken by the manufacturer, rather than machines being scrapped when they break down. As well as providing added revenues for manufacturers that would spread over time, this would trigger a change in the design of washing machines which would enhance the focus on longevity. There would be major cost savings on manufacturing materials, something which may become very important in the future. The more scarce materials become, the more expensive they will be – a real pressure point for the industry of tomorrow. Re-use and repair services and leasing models will inevitably start to become more appealing to businesses which are looking at ways to turn a profit in the face of increasing costs. In the past few years, the sharing economy or collaborative consumption has demonstrated new ways of distributing goods and services to consumers. As goods are shared instead of owned, the sharing economy represents an alternative to our consumerist society. Take for example Bla Bla Car, where people can share a ride, or Airbnb where travellers can rent a spare room in someones home, as an alternative accommodation. This peer-to-peer business models had prove to be successful. However, there still some barriers as they depend on trust between people. Similar business models could be applied to other products such as large household appliances. A laundrette is the perfect example. In Scandinavian countries, famed for their sustainability, it is very common to find laundrettes in private apartment blocks. However, in the UK and many other countries laundrettes are often perceived as unhygenic and people can be snobby towards them. Such attitudes aren’t helpful. 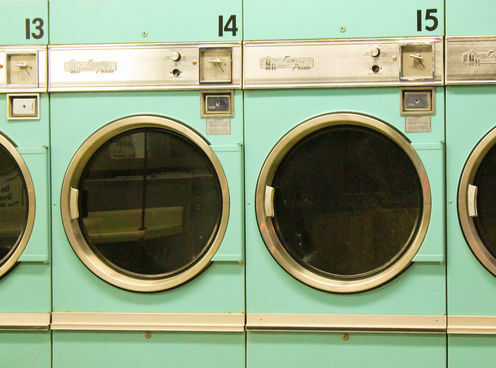 We should reinvent the laundrette as a key part of the shift towards a more sustainable, sharing economy. Mariale Moreno does not work for, consult to, own shares in or receive funding from any company or organisation that would benefit from this article, and has no relevant affiliations.